The Grey Mare is a small, humble inn located in Chorrol's Fountain Gate. It is found just to the east of the south gate. The publican, Emfrid, buys potions and food while only selling the latter. The ground floor contains the reception area consisting of a counter and a dining room while the rooms are upstairs. The room that you can rent is dark, small and quite bare, containing only a lower-class bed and a chest. The room next to yours, which is locked, is owned by Earana. You will find her sleeping here until the Fingers of the Mountain quest is finished. The bedroll inside is free to sleep in. 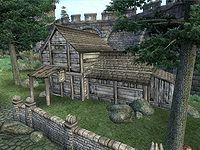 When Chorrol citizens say that there is work to be had at the local inn they refer to The Gray Mare rather than The Oak and Crosier. The chest in your room won't reset after 72 hours and can be safely used for storing items. The publican Talasma of The Oak and Crosier says "The Grey Mare is more suitable for… others" even though a room at both inns costs the same. The people of Chorrol may be heard saying "You know, Bongond has got some fine horses for sale over at the Grey Mare. Too bad he's such a pushy man." Of course, Bongond actually resides at North Country Stables. This page was last modified on 8 July 2018, at 16:04.